As in ‘concrete example of knitwear design’. This is a sweater chosen for me by the consultant at Liberty, after she’d assessed my character and body shape. Note (if you can from the bad photo) that it’s marginally too big for me: I’m only 5’4″, but my 38″ bust means off-the-rack clothing that fits my height will be far too tight across the, er, chest. One reason I drifted into wearing over-size sweatshirts. But I digress. Points brought to my attention by M and the consultant: 1. It has a v-neck, albeit small and off-centre. * V-necks break up an expanse of chest, making it less obvious to everyone bar the wearer. This one isn’t really deep enough. 2. Patterning also breaks up what I perceive as a ski slope south of my neck. 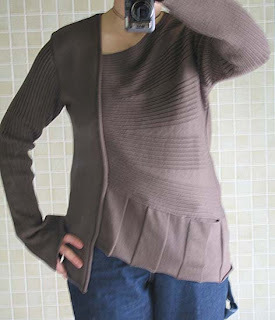 Here the horizontal ribbing is broken by that incredibly strong vertical, so it doesn’t make me look wider than I am. Which works with 3, slight waist shaping, to make clear that I do have a waist. 4. The emphatic horizontal hemline that would draw attention to my hips is replaced by movement sweeping away from the strong vertical – and it’s even got vertical detailing to make that panel look narrow. With a pocket that I gather really should be sewn almost shut. Mind you, it’s too small to be useful. I couldn’t even put my pocket knife in that. (Yes, I tried) 5. Long sleeves bell at the end to make my arms seem longer and thinner (why is that a good thing?). 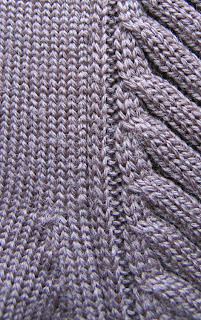 The designer used the curl of plain stockinette to perfect advantage: the vertical is just a strip of knit fabric allowed to curl. (All the garment edges are simply bound off and left to curl, too. Here‘s another top that uses that to good effect.) 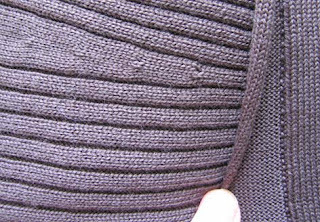 The perfectly placed triple increases make one small rib widen until entire groups of small ribs are perceived as ribbing across the garment front. Isn’t that clever? This is the shoulder. The ribbing for the arm grows organically away from the seam. Even the increases for the bust are beautifully placed. There’s more I won’t show you, because I don’t think it’s fair to put all the design details online for reference. But the waist shaping is due in part to a repeat of the ribbing&triple increase down the back, and this also gives the sleeves their shape. A single strong, elegant idea used everywhere to advantage. I wish I could afford more stuff like this. As it is, I’ll have to apply the principles to garments I knit for myself. Or divorce him and marry someone really wealthy… no, there are some things in life more important than architectural clothing. Just barely. * Seen the Spring 2007 IK? ‘Slanted Neck Pullover’? I think it’s not slanted anything like enough: on the model it looks as though a knitter got a normal v-neck wrong and hoped it might pass for art. This entry was posted in Uncategorized on February 23, 2007 by sarahw. wow. this sweater is ever so clever, and interesting. makes it fun to wear! who is the designer? Bother. I should have said. It’s a French fashion line, ‘Crea Concept’. Sarah, I have nothing useful to say. But I did want to tell you that the jumper is just heart-flutteringly gorgeous and looks FANTASTIC on you. Absolutely love it. And I’m so pleased you like yourself in it so much. Worth every penny.